Yetta G. McCullom, D.D.S., M.S. - Cornell McCullom III, D.D.S., M.D. - Robin L. Ferguson, D.D.S., P.C. Are you ready for a healthy, beautiful smile? As our patient, you’ll not only look great, you’ll feel better, too! We are a multi-specialty south side Chicago dental practice with a unique difference. Dr. Cornell McCullom, Dr. Yetta McCullom, and Dr. Robin Ferguson provide a full-range of surgical, laser, and cosmetic dental services to meet virtually all of your needs in one convenient location. We also offer aesthetic facial enhancements to dramatically improve your appearance and your self-image. Our south side Chicago dentists use leading-edge therapies and modern technology to provide clinically excellent care with a focus on your comfort. We’ll always do what’s right for your smile and respect your wishes. You’ll never be pressured into treatments you don’t want or need. Visit our comfortable, contemporary dental office and find out why our patients think of us as the Dream Team for Beautiful Smiles and Faces! 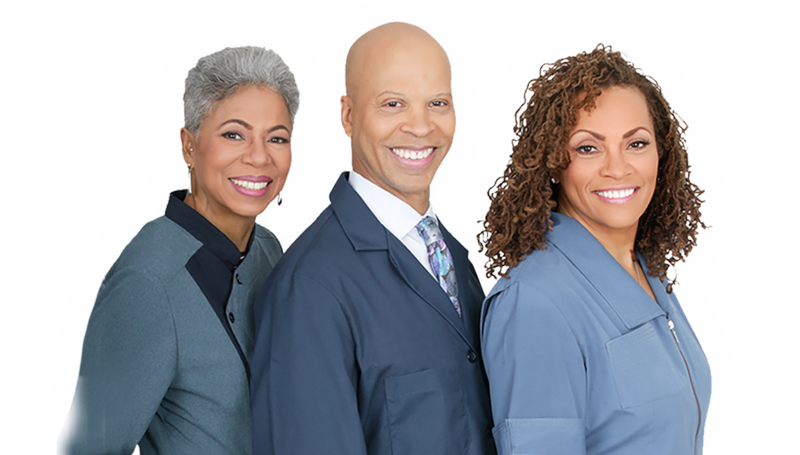 Call our Chatham, Chicago dental office today to schedule your appointment or consultation with Dr. Cornell McCullom, Dr. Yetta McCullom, or Dr. Robin Ferguson. Our contemporary South Side Chicago dental office serves the entire Chicagoland area and beyond with professionalism and care for fabulous smiles. Our Chatham neighborhood dentists possess the knowledge and skill to treat a comprehensive array of dental and aesthetic concerns. Dr. Cornell McCullom has extensive experience in implant surgery and is one of only a handful of oral and maxillofacial surgeons in the country with a medical degree. His wife and partner, Dr. Yetta McCullom, specializes in the medical and surgical management of periodontal disease. Dr. Robin Ferguson completes the Dream Team with expertise in general dentistry and a focus on the unique needs of patients of all ages. Learn more about your Chicago Dream Team! Dr. Cornell McCullom uses his dental and medical training to offer a wide range of facial aesthetic services to enhance your natural beauty and restore your youthful appearance. Whether you need keloid removal, line smoothing, or even surgical rhinoplasty, our team has the training and experience to ensure fantastic results. Schedule a consultation to see how Timeless Beauty can improve your confidence and enhance your life. Please take a tour of our South Side Dental Office. The Doctors are always welcoming new patients! Contact us for more information or to schedule an appointment. Our Dental Dream Team doctors have been featured by many news organizations for their expertise. Dental Dream Team on the News! The Offices of Drs. McCullom, P.C. and Dr. Robin L. Ferguson, P.C.